Note that a 20 megaton bomb would completely destroy buildings within 6.4 km, destroy most buildings within 17 km and damage all buildings within 47 km. The largest ever tested nuclear weapon had a yield of over 50 megaton, and that was in 1961. Do you think that nuclear technology has improved since then, or stayed the same? The US will not carpet bomb Iran and certainly would never drop a nuclear weapon on that country. Iran is a country with a GDPof less than 2 years of the US military budget, and the US military budget accounts for 3.2% of the total US GDP. Such actions would be considered grievous war crimes, both internationally and within the US. Unless you're expecting the US to turn into a genuine totalitarian dictatorship within the near future, have no doubt that the action of killing 70 million innocent people would be held to account by the American public, American law, American politicians, and that of the world as well. Source, source. In fact in the current political climate, it is very hard to see a genuine war breaking out with the US and Iran. Given the political and military disasters that are Afghanistan and Iraq, and the fact that, despite counter claims by irrational ignorant political hacks, the US is still a democracy, it is very hard to see any serious support in the US for more serious military action against another Middle Eastern nation. At best we will see more serious sanctions and possibly air bombing at the extreme. Beyond that, it is impossible to see the Democratic senate or the next president supporting ground troops in the US, at least until Afghanistan and Iraq have been better dealt with. The politicial bias of beast's statement is so obvious and has been dealt with so much already, the focus here will exclusively be upon nuclear weapons propaganda. First, wikipedia (which beast has elsewhere quoted in his defense of the reality of "nuclear" weapons) does not hardly have the final word on truth. 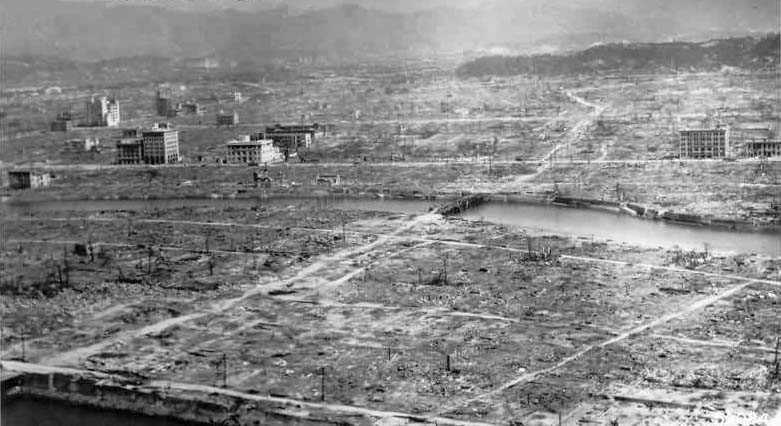 Second, the principle verifiable evidence for the existence of nuclear weapons is the bombing of two cities in Japan in 1945 - Hiroshima and Nagasaki. The chief inspector of the US Secretary of War for these cities in the aftermath of the bombings was US Army Major Alexander de Seversky. He investigated many bombed cities throughout Japan. On each occasion, he first conducted an aerial survey followed by a through investigation on the ground, and he detected a similar pattern in every city evidently due to the methods of the bombers as well as the nature of the targets bombed. He was prepared for and anticipated quite a shock in Hiroshima yet found it to be completely the same as the rest of the cities he had surveyed. There was no bald spot at the centre of the blast. The metal framework of buildings standing in the middle epicentre of the bomb blast were intact. Some bricks had been blown out of those in the very centre, but the Hiroshima hospital only a mile away from the center of the blast suffered nothing more than having its windows blown out and no people in the building were even hurt. The greatest damage was NOT done by the blast but by fire as an after effect which accounted for at least 60,000 of the 200,000 persons who perished according to his report. Ratty wooden houses of which there were many constituted the main structural damage. Seversky concluded that the bomb had the effect of a large incendiary as most of the damage was caused by fire alone and not by the blast. He also stated that a great deal of wood remained in the rubble of the main area of the blast indicating that those buildings had not been incinerated by the heat of a blast but were destroyed afterwards by the fire that resulted from the bomb. He stated that a fleet of 200 B-29's which each dropped a routine load of incendiaries would have accomplished the same thing. The same applies to Nagasaki. As a matter of fact, the Nagasaki bomb was alleged to have been more powerful. However, the principle area affected in Hiroshima constituted roughly a four square mile area with the blast in the centre (i.e. 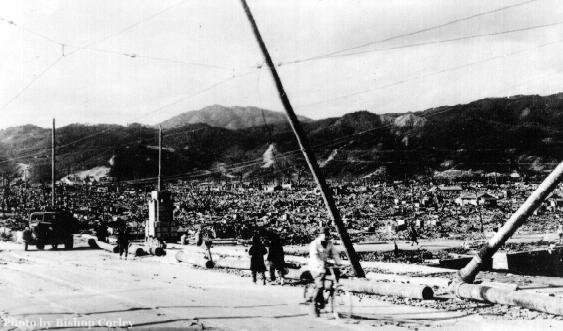 roughly a one mile radius around the centre of huts toppled by fires) yet the principle area affected in Nagasaki's allegedly more powerful bomb was only one solitary square mile. Major Seversky stated that the effect of one of these so-called atomic bombs dropped on New York City would affect an area much smaller than one of the five main buroughs. As far as the retort to Seversky's article in the May 1946 issue of Reader's Digest, NONE OF THE AUTHORITIES INTERVIEWED CONTESTED SEVERSKY'S DESCRIPTION OF HIROSHIMA OR NAGASAKI OR THE FACTS HE STATED. They only argued his opinions such as his comparison with New York City and his allegation that the incendiaries of 200 B-29's would have accomplished the same effect. I invite beast to visit for himself a library and read the results of of Seversky's investigation in the February 1946 issue of Reader's Digest in an article entitled 'Atomic Hysteria' which received a mountain of protest by so-called experts in america who never came any closer than 5000 miles away from Japan and who yet insisted that Seversky's opinions were unfounded. Do see their reply three months later in the May issue in which the author interviewed many military and scientific authorities in an effort to refute Seversky's article. Note: these articles were apparently censored from the British edition, but they do appear in the American editions of Reader's Digest for February and May 1946. Beast may take course to cite diverse alleged nuclear tests (below ground, above ground, et cetera) throughout the Cold War in a number of large countries. However, these tests including their precise location and especiallt timing were always military secrets. We are supposed to believe the propaganda that we were racing the Germans to build the bomb, and miraculously developed it at the end of the War as opposed to having it ready to use throughout the War. The more a weapon is used, the more it is open to investigation and expose of the ruse - the same reason the alleged Moon missions stopped. Radiation fallout? What a load of rot. As part of the synthetically manufactured atomic hysteria In 1947, twenty-six young men came who worked with these allegedly WMD nuclear weapons came into bodily contact with plutonium. In 1980, a medical survey was conducted of these twenty-six men who lived with plutonium inside them for 32 years and concluded that they had all lived normal lives and only two of them had died - one was run over by a truck and the other for a similarly irrelevant reason. And do not tell me that I am not qualified to write about this as my sources speaks for themselves. You can begin with Major de Seversky. And incidentally, I am myself a US Navy submarine veteran who was assigend to an SSBN. What would be the point of such propaganda? Observe how the US garners what little support it has for invading and manipulating those countries it does not control already or choose not to follow its belligerant imperialism. And while we are talking about Iran (this goes for cheesejof as well), why do you focus on Iran? Do you let Bush choose your enemies? What makes him your mind? What about Turkey for example? Since beast hates islam so much, why don't we read something from beast talking about racism and terrorism by the Grey Wolves or a similar group? They easily have far more ambitious plans than the Iranians who comparatively keep to the themselves. So you're saying that all this damage was caused by a fire? Or are these photos fake? And how do you explain images such as these? Some guy just came along and painted them? It is ridiculous and false to claim that nuclear bombs do not exist. Yeah out of curiosity, those buildings standing in the middle of the wasteland? Why didn't THEY get leveled too? And yeah I believe America did cause serious fire damage. We did what is called a fire storm on a few Japanese cities. We dropped a few lines worth of fire bombs in a specific pattern which drew an X or a * on the city. After that mother nature took over by whipping the flames into a massive inferno of fire and high speed winds. I would imagine the reason those buildings remained would be a combination of being much stronger buildings than those around, ie. many buildings in Japan at that time would have been made predominately from wood and paper, while the ones not completely demolished appear to all be large cement or stone buildings, and also I'm sure chaos theory and fluctuation in the force of the blast would have played a significant part. I think it would be good if people could refrain from posting meaningless insults like Sokarul's. Posts like that add nothing to the forum or the discussion. Um, it's ridiculous and false for anyone to claim that you're not retarded. Those photos could have been easily been fake. I mean, all pictures of the Round Earth are fake, why couldn't these be? Of course the photos theoretically could have been faked. However if Dio wants to convince us that nuclear bombs do not exist, the burden of proof is on him to demonstrate those photos are fake. If he does not do so, it is logical for us to assume the photos are real. In regards to photos of the round Earth; it is the round Earthers who are trying to do the convincing that the Earth is round, there are no flat Earthers trying to convince people that the world is flat. Therefore if they want us to believe that the Earth is round, the burden of proof is on them to prove that the Earth is round. To sum up; there is no burden of proof on somebody to prove something to themselves. The burden of proof is always on the person trying to convince people that their opinion is the correct one. In this case it is Dio who is trying to convince us that nukes don't exist. In the case of the FE, it is the REers that are trying to convince people that the Earth is not flat. True, but how in the world could he prove they are fake? Despite popular theory on these particular forums, identifying falsified images is a lot easier then you would think. I can safely say that those photos are 100% real. They show very little (if any) distortion effects and it would actually be impossible to replicate those images involving shadow in a real world studio. I think the thread starter turns 1 year old November 17th. I take it that beast's photos represent the middle of the blast which depict buildings still standing and a bridge still in place. It is worth pointing out that of all the bridges in Horashima, Major Seversky noted that only one collapsed and not even that one from the blast but from people afterwards. Neither does Beast have any refutation of Seversky's facts. He only relies to what I have already anticipated - military propaganda. I have refuted the Hiroshima and Nagasaki bombings BECAUSE THEY ARE VERIFIABLE. The assertion that the bombs just keep on getting bigger and bigger rests on assertion only. Where is proof of the 1961 bomb's alleged destructiveness or the outlandish assertions of a bomb leaving no buildings unaffected within 46 kilometres? Bomb explosions that are military secrets and not open to verification are not an argument as they are not verifiable. beast's tactic is since the only two bombs on which the propaganda relies cannot withstand close scrutiny, he proceeds to make even more ludicrous and unverifiable claims about the bombs of the Cold War era. Since the Cold War is over, let's recognize propaganda for what it is and move on. But beast is still stubbornly fighting the Cold War. He believes in a mirage. I suppose beast will now proceed to post the same old 1950's photos of mushroom clouds that we have all seen a thousand times. A very destructive bomb is not needed to produce a mushroom cloud. It is impossible to create a bomb that will destroy an entire city. Seversky stated that no bald spot was left in Hiroshima, but his detractors retorted that is becaue it was detonated in the air in order to destroy a larger area with a somewhat smaller intensity over a wider area. In other words, there exists a trade-off between an intense devastation in a small area and a wider devastation with a corresponding lighter intensity - A PHYSICAL LIMIT TO THE AMOUNT OF DESTRUCTION WHICH A BOMB CAN ACCOMPLISH. Why is beast so ready to believe unsubstantiated military propaganda to the contrary? I submit that the reason is because beast is religious in spite of himself. Judging by beast's fascination with statistics and numbers (the bigger the more impressive, eh? ), beast adheres to what labor historian David Noble has called the religion of technology and what French writer Rene Guenon in 1945 called the Reign of Quantity. Why would India and Pakistan both perpetuate this supposed myth? Why would Iran, when it could lead to them being attacked? Why would North Korea? I am that if I did some research, I could easily present non military evidence of the existence of nuclear bombs, but I can see no benefit in further engaging with somebody has cut off from reality as you. You should seriously seek medical help, although I suspect you are afraid that the doctors are out to get you, and will not. See I can respond with irrelevant comments as well. The atomic hysteria of the late 1940's and 1950's and today is not only propaganda for obvious political purposes. It is an attempt to maintain the Rutherfordian concept of a nuclear atom. At the height of this propaganda in the 1950's, Dewey Larson wrote an expose of the basis of the myth - the idea that atoms are composed of lesser substances called protons, neutrons, and electrons. Of course, the nuclear atom is a myth on top of a myth. Atoms themselves do not exist at all. It is a false theory of Pythagoras's students Leucippus which Pythagoras learned from secret sects in India when he visited there in the sixth century BC at the behest of the jews in Babylon to spread the worst heresies of the hindus in the West. Beast cannot come up with verifiable proof of alleged nuclear explosions since 1945 so he has resorted to name calling and character assasination. In other words, I win. In the meantime, I am still waiting for verifiable proof or convincing evidence of actual any actual nuclear explosions after 1945. Taking your word or the government's word for it is not good enough. So what is Trident when it's at home? I believe that one of the reasons that 40,000 people were protesting in London a couple of weeks ago was to protest against the renewal of this WMD. Also note that the bombs were detonated above the ground to maximize damage (More in the sense of range). A bomb detonated above the ground will affect a much larger radius then one that collides with the ground to detonate. The reason you're still seeing some buildings still standing near ground zero is because both bombs were set to detonate in the air before they hit the ground, increasing OVERALL damage yet reducing damage at ground zero. Post your source for this Major de Seversky story. Ko(o)be, aswell as many other cities in Japan were firebombed. These cities were DAMAGED MORE THAN HIROSHIMA AND NAGASAKI, not to mention people died worse (imo). Read/watch Grave of the Fireflies for more on the devestation in Koobe. About the bomb - keep in mind, it was a low yield blast, and it was detonated _midair_ very high above ground zero (Excuse me for not having a source for how high it detonated at). This essentially just splattered radioactivity across the whole area. As you see in some of the pictures, and from other sources, people were turned into nothing more than shadows... fire does not do this. Are you shitting me? You really think atoms don't exist? E=mc^2 thus nuclear bombs. Many people died. Its not funny to joke about how they didn't. Many more died from radiation. It was dropped in front of a hill moron. They fuzzed up the mission. The hill took the main blast, but there was still some fallout. This is the main reply I had been awaiting. Seversky's article also mentioned that the Hiroshima bomb had been detonated in the air as to maximize the area affected (which was again incidentally a non-military area) even though that meant somewhat less of a destructive effect in the immediate area. He stated that there is a trade-off between the destructiveness attainable by the blast and the breadth of area affected. In other words, THERE IS A PHYSICAL LIMIT TO THE DESTRUCTIVENESS ATTAINABLE BY A SINGLE BOMB. I have also been awaiting this retort. It is easy to accomplish one's objectives when one's opponents are confused and distracted into fighting sideshows. I myself generally sympathize far more with the political left. However, that does not blind me from seeing that well intentioned people and organizations have dedicated decades to fighting a mirage. As stated in the lead article, Major Alexander de Seversky was the Special Assistant to the Secretary of War for the investigation of bombed area in Japan. His article appeared in the February 1946 issue of Reader's Digest, and this story was not allowed to be printed in the British editions but the American editions of that journal only. I am unaware of this information being available on-line, but I will search for it. His detracor's reply appeared in the May 1946 issue. The most certain way of attaining both articles is by visiting a library which has them or ordering them through interlibrary loan and photocopying or scanning or ordering this through a used book dealer which stocks old Reader's Digests. A few years back Ralph Epperson wrote a book to the same effect which I have not attained yet, but I will search for his website and post it. Nathan Martin Gwynne wrote a privately circulated essay on this subject back in the mid-1970's which was printed I believe in the Nemesis journal in the late 1990's. I will search for this as well and subsequently post a link if found. EDIT: I located Ralph Epperson's book. It does not go as far as myself, Gwynne, or Seversky in that Epperson believes that the United States is the only to ever have nuclear weapons. However, his information could perhaps provide more insight into how the leaders of countries like India and Pakistan buy into such propaganda. Dresden in Germany suffered more damage as well. It seemed a lot of places suffered more damage than the Hiroshima and Nagasaki bombs. (Excuse me for not having a source for how high it detonated at). Considering that the Reader's Digest articles referred to stated that the height of the bomb during detonation was a military secret, your lack of a source is not surprising. And for exactly the same reason neither is beast's failure to come up with any evidence of bombs which allegedly destroy entire cities at any time since then. Nuclear weapons were Cold War propaganda. It's time to progress, people. The explosions depicted in these photographs are simply explosions of large bombs, missiles, and in some instances large smoke bombs. One can judge the size of these bombs and the blast that they create by virtue of the fact that trees or other objects such as island shores and hilltops which give at least a relative idea of size are located nearby. Hardly the kind of blast in any of these photos which leaves no building within a 46-kilometre diametre unaffected (! )(as one poster claimed earlier in this thread). 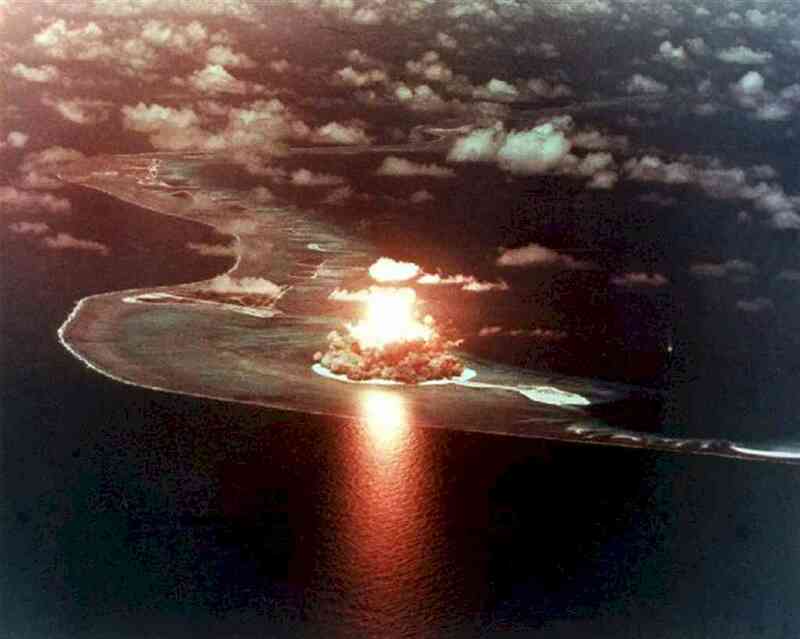 A photograph taken by a naval ship or aircraft of a bomb being detonated off the coast of Nihau, Hawaii or somewhere else in the Pacific is published, and you take it for granted that the bomb is nuclear because they say so. That's called gullibility. You've been had. I had hoped more convincing photographs would have been posted. 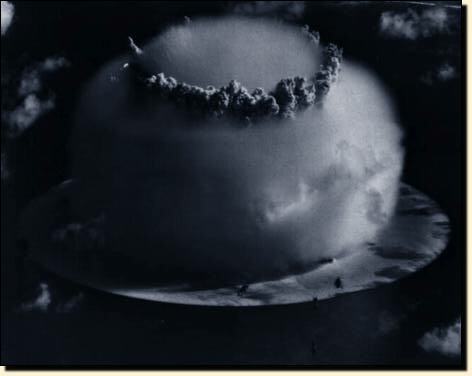 A couple of older and more convincing photographs (which you failed to post so I will help you out by mentioning them) in which naval ships are to be seen in the photograph in relation to the mushroom cloud, these mushrooms clouds are produced by bombs deliberately designed to produce a large amount of smoke precisely for a magnified propaganda effect. Anticipating that someone would eventually go ballistic and post such photos, I earlier stated in this same thread that a so-called nuclear bomb is not necessary to produce a large mushroom smoke cloud. In other words, there is no more boom behind your smokescreen than that of any large non-nuclear bomb - which kind of bomb explosions happen to be exactly what has been displayed in the preceeding photographs. At any rate, a nuclear bomb is not all that hard to grasp. It is a very simple concept.